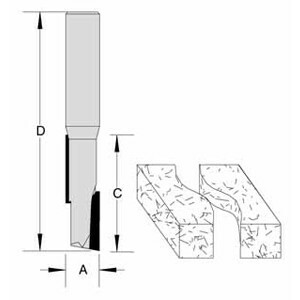 Staggered tooth bits have the fast cutting properties of a single flute and the balance of a two flute. 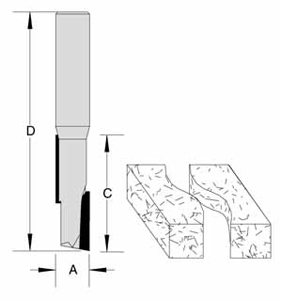 A single carbide tooth is placed on opposite sides of the bit, one placed high and one placed low. These bits are great for cutting double sided melamine panels, laminates and solid surface materials. Stagger Tooth Plunge Bit 2 Flute 1/2" x 1-1/2" x 1/2" Shank OA Length 3-1/8"
Stagger Tooth Plunge Bit 2 Flute 1/2" x 2" x 1/2" Shank OA Length 4-1/4"
Stagger Tooth Plunge Bit 2 Flute 1/2" x 2-1/4" x 1/2" Shank OA Length 4-1/2"